The Bright Lord, Shadow of Mordor's new DLC campaign, promises an epic showdown with Lord of the Rings head honcho Sauron. It was designed in part to address a common fan complaint about the original game's anticlimactic ending. But while it does give players a chance to fight Sauron, I'd hardly call it an epic battle. Similar to Lord of the Hunt, last year's disappointing DLC for Shadow of Mordor, The Bright Lord has some neat ideas. The problem with it is they're so hastily introduced that they fail to offer anything genuinely novel or exciting. Like Lord of the Hunt, The Bright Lord takes place in a pared-down version of Mordor's original map. The new campaign casts you as Celebrimbor, the elven warrior who Mordor fans will remember as the spirit who lived inside of Talion. The Bright Lord's story takes place thousands of years before Mordor's, so Talion is nowhere to be seen this time around. Instead, you get a chance to play through the events that led up to Celebrimbor becoming a spirit elf who weds himself to Talion. The campaign is set in a modified version of Udun (one of the two worlds in Mordor) as it existed during the height of Sauron's power. It starts shortly after Celebrimbor steals the one ring from Sauron—his plan being to wrest control of Mordor from the guy. So: players face off against Sauron, the biggest and baddest villain in the Lord of the Rings universe. And they have the ring at their disposal to help them do that. Both of these factors probably sound like great things for Tolkien fans. So what's the problem? Again, like Lord of the Hunt, the new DLC has a lot of awesome potential. But it lets it go to waste by applying its new features so hastily and unevenly that they fail to add anything fun to Shadow of Mordor's great gameplay. The sloppiness of their implementation makes playing The Bright Lord a far worse experience than the one I had playing Shadow of Mordor last year. First and foremost, there's the (sort of) new setting. The Bright Lord's version of Udun is meant to be a dark and scary place, since it's ruled by Sauron when he's unequivocally in charge of things. But the way that Monolith put this into practice was to just make the map a lot darker. The scenery is overcast with a grainy and stifling layer of cloudy red stuff that, rather than add any sense of ominous menace, just ends up clouding your vision. This makes it difficult to move around Mordor's open world and do all the stuff I enjoyed so much in the original game. It's a neat visual flair that's fun to admire for a little while. But imagine trying to play an entire game that's set inside the wispy vision sequences from Peter Jackson's Lord of the Rings trilogy. As for Celebrimbor as a character? Well, he's nearly identical to Talion in terms of his abilities and move-set — the main difference being that his ranged bow-and-arrow attacks don't have the same slow-motion effect that Talion's did. Other than that, he has a small number of new moves that all center around "branding," the mind-control ability from the original Mordor campaign that lets you bend enemy orcs and uruks to your will. Even more peculiar is the fact that Celebrimbor starts The Bright Lord with all of his special abilities unlocked. Except for a handful of short ring-themed challenge missions (which are identical to the weapon challenges in the main game), there aren't any ways to develop Celebrimbor's character. And all completing the ring challenges gets you is longer slowdown times when using the ring's bullet time-esque power. I won't spoil The Bright Lord's story, but the arc of the new campaign is similar in scope to The Lord of the Hunt. You're tasked with branding all five of the warchiefs in Udun and then forcing them into battle against Sauron. The meat of The Bright Lord's gameplay therefore involves infiltrating enemy fortresses and duking it out with the nemesis orcs within before mind-zapping them, though the DLC also adds other orc-killing missions as a requirement to capturing the fast-travel towers sprinkled around the map. None of this has to be a bad thing, mind you. Playing through a new miniature campaign centered around killing and dominating Mordor's colorful orc and uruk enemies sounded like it would just give me yet another excuse to mess around inside the game's wonderful nemesis system. The problem with The Bright Lord is that it doesn't give you much of a chance to do that. The campaign is very short, and unlike the original campaign or Lord of the Hunt, has a hard reset once you've completed it. It took me maybe 7 or 8 hours to complete, though you could probably finish it in much less time than that. It isn't long enough to give the nemesis system room to breath. So rather than developing into something dynamic and interesting, the uruk infrastructure present in The Bright Lord ends up confronting you with a series of arbitrary and frustrating challenges. What's particularly irritating about the brevity of the new DLC is that Monolith said they were trying to make The Bright Lord more difficult than the original Shadow of Mordor campaign—a decision that, like Sauron's boss fight, was inspired by fan criticism that the game became far too easy by the time players had maxed-out all of Talion's abilities. The Bright Lord is noticeably more difficult, but only in irksome ways. One major change Monolith introduced, for example, is that you're no longer able to target a warchief's individual bodyguards if one of Udun's toughest uruks is giving you trouble. Rescinding this option eliminates one of the most effective (and therefore easiest) ways to make a tough enemy more manageable in combat. But that also means that you no longer have a creative strategy to tackle a difficult enemy. Instead, you're forced to keep confronting the same group of high-ranked nemesis orcs in roughly the same way until you manage to defeat them. In a similar vein, all of The Bright Lord's missions and challenges require you to use Celebrimbor's branding abilities. When I say all of the missions, I really mean all of them. Every single one of The Bright Lord's quests revolves around some sort of branding-themed challenge—requiring you to survive in a battle for two minutes and make sure that you have at least ten branded orcs and uruks for the whole time, or stealth-brand a bunch of orcs without being detected, stuff like that. 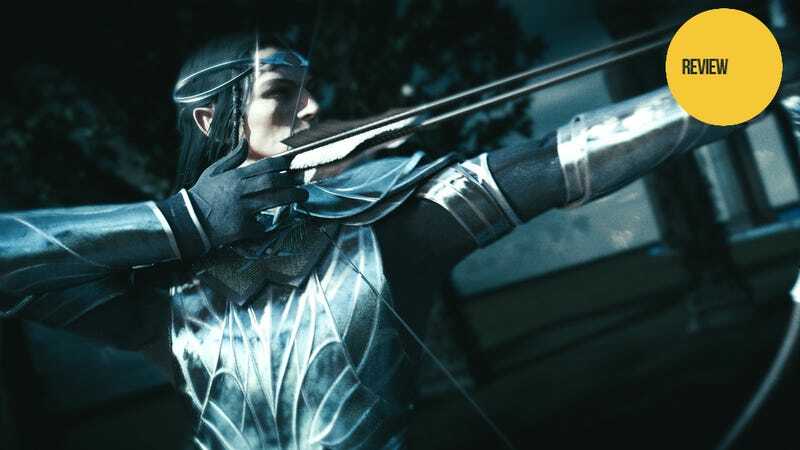 Again, Celebrimbor's branding moves are nearly identical to the ones Talion had in the original game—the main difference being that the elf has a few additional ways to brand bad guys. Now you can execute a "ground brand," which is the branding version of Talion's finisher for orcs who've been knocked off their feet. There's also a sort of shockwave attack that brands a portion of the orcs in your immediate vicinity. Oh, and the only way to recharge Celebrimbor's ring powers is by—you guessed it—branding more bad guys. No matter where you look in The Bright Lord, there's more branded content. And not the good kind of branded content. The problem with The Bright Lord's fixation on branding is that it was the worst part of Shadow of Mordor's gameplay. The DLC's changes don't do much to improve upon it. While branding gives the player extra sidekicks to bring into battle, these mind-controlled allies are impossible to control in any effective way. Both Celebrimbor and Talion, meanwhile, still attack branded orcs and uruks by default—meaning that you have to be extra careful while performing standard melee combos if you want to keep mind-controlled allies alive as long as possible. Added on to that existing frustration is the fact that Monolith tweaked Mordor's health system for The Bright Lord so that you have to sacrifice branded orcs any time you want to heal yourself. The developers didn't add any new features that actually make managing your small army of branded orcs more feasible and therefore more enjoyable, meanwhile. These three factors add up to an experience that legitimately is more difficult than the original game, but only in the worst ways possible. And, finally, what about the showdown with iconic fantasy bad guy Sauron? Again, I don't want to spoil anything. So I'll just say that the final boss fight isn't worth the hassle involved in getting to it. What made Mordor's climax disappointing was that it was an unimaginative way to sum up the game's most provocative features that played out in the nemesis system. Celebrimbor's battle with Sauron repeats the same error, albeit in a slightly different way. The new stuff that The Bright Lord introduces isn't bad, exactly. The ring of power and Celebrimbor's newfangled branding powers are fun to use when they manage to mesh gracefully with Mordor's already solid combat. But whenever I did notice that I was having fun, say, killing bad guys in slow-motion, I couldn't help but think how much more enjoyable it would be to have access to that power in the original Shadow of Mordor campaign. Like The Lord of the Hunt, Bright Lord's best ideas end up going to waste simply because they're closed off behind an arbitrary virtual barrier of a self-contained campaign that's nowhere near as good as the base game. As the final piece of DLC in Shadow of Mordor's season pass, The Bright Lord puts one of the best games of 2014 to rest on an uneasy note. I absolutely loved Shadow of Mordor, so I've been disappointed to see its developer build on its original work in such an uninspired way. I hope that whatever Monolith does next with Mordor pays closer attention to what made their original work such a joy to play.